It goes by many names, including Youth Power Indiana in Indianapolis, Kids for Climate in Lawrence, the Youth Climate Task Force in South Bend, or The Promise Project in Carmel. but whatever you call it, it is an intergenerational collaboration to work with city officials — elected and/or appointed — to enact ambitious climate resiliency goals such as a Resolution or Ordinance. We at Youth Power Indiana believe that if we don't dramatically confront the impacts of climate change, our future is imperiled. And so it is time to work together to reduce waste and greenhouse gas emissions while increasing energy efficiency and carbon removal projects, like planting trees. We are guided by the work of iMatter, whose web site features numerous tools. If interested in starting a Climate Recovery initiative in your town, contact our director, Jim Poyser. 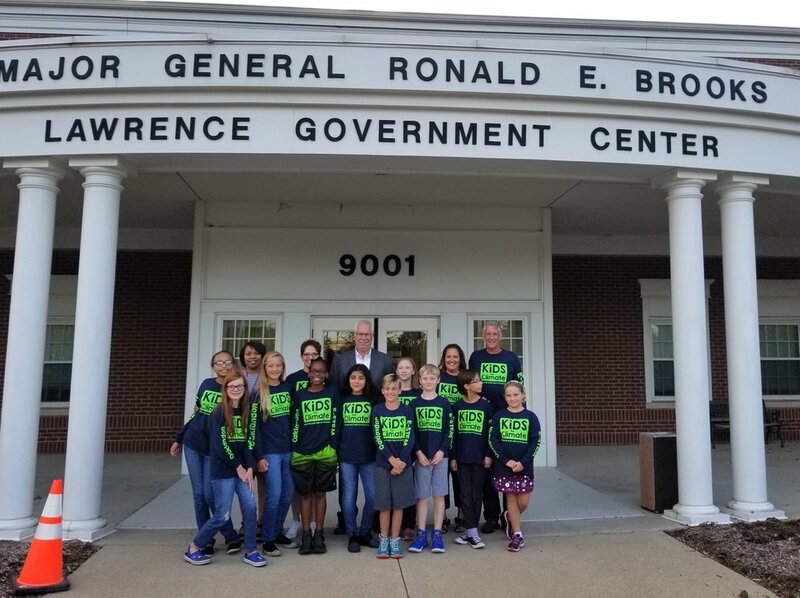 On Sept. 5, Oaklandon Elementary's Kids for Climate group presented to the Lawrence Common Council on the need to adopt a resolution. A team of students presented on climate change and referenced Carmel and Indy's successful efforts earlier this year (see below). There was a vote and the resolution passed unanimously! Soon after, Kids for Climate posed with Lawrence Mayor Steve Collier to celebrate. We are thrilled to see both this Proclamation as well as the Resolution adopted. The City of Lawrence is showing true leadership in protecting its youngest -- and future -- citizens from the impacts of climate change. As part of our intergenerational approach, this photo was taken on June 5 in a meeting we had with Mayor Collier, center, white shirt. Mayor Collier was busy working on the Resolution and needed some input. After months of development outgoing 8th grade students from St. Bartholomew in Columbus gave a ten minute presentation on climate change and the need for action on Tuesday, June 6. The students took turns covering various aspects of the issue, from the urgency of climate change to the need to attract new young talent to the city. Led by climate coaches Barry Kastner and Bridget Steele, the students delivered a masterful argument to an attentive city council. Below, see photos, and stay tuned for developments! The Climate Restoration team practices before the meeting. A full house was in attendance and the students received thunderous applause after. Numerous city councilors thanked the students. Climate Restoration team celebrates after. CArmel's The Promise Project — VICTORY! On Monday, Feb. 20, the Carmel Council passed the Climate Recovery and Resilience Resolution unanimously! See press coverage here and here. And go to the Promise Project page for a full accounting of this momentous action! The Carmel crew after the unanimous vote. Carmel youth have the benefit of working with one of the country's most forward-thinking elected officials, Mayor Jim Brainard of Carmel. On a visit in fall of 2016 to Carmel City Hall, the Promise Project team met with Mayor Brainard and the meeting turned into a work session on the Climate Recovery Resolution. The Promise Project (left to right): Adult coach Leslie Webb, with Natalie, Miranda, Alex, Jose and Jodh. On Monday, Feb. 27, one week after Carmel passed their Resolution, Indianapolis passed a Climate Recovery Resolution. The Resolution calls for: carbon neutrality in city functions by 2050; the creation of a climate action plan for Indianapolis, a process to begin within 30 days of passage; and recognition of the need for a community involvement and input, including youth voice, in determining Indy’s future. Building up to the full council vote on the 27th, our youth testified about the Resolution to the Public Works Committee on Feb. 9. We brought ten speakers, climatologist Gabe Filippelli from IUPUI, followed by nine youth people, ages 10-20. The Public Works Committee was attentive and supportive throughout. Thanks to sponsor Zach Adamson, Vice President of the City-County Council for his leadership and for councilors like Jeff Miller for speaking up on behalf of the young people of Indianapolis. Next step is a full council meeting on Feb. 27, 6 p.m., please join us! To prepare for this hearing, here are two photos — before and after — or most recent meeting with two Indianapolis City Councilors, Zach Adamson and Jared Evans, on climate recovery. This meeting took place in late November. Mayor Steve Collier of Lawrence heard about Oaklandon Elementary's involvement in Indianapolis' Climate Recovery Resolution (see below), and was inspired to meet with them to discuss their concerns about climate change and Lawrence could do to address this essential issue. After that meeting Mayor Collier invited us to visit him and on Monday, June 5, our team met with the mayor for about 40 minutes, discussing what Lawrence is already doing to become greener, and how, when the students return in August/September, the city council can get engaged. At Climate Camp this summer, campers helped Oaklandon kids prepare for their testimony in a mock city council setting. Columbus has an amazing Climate Recovery project going and is different from Carmel and Indianapolis in numerous ways. The biggest difference is the project is based almost entirely at one school, St. Bartholomew. Eighth graders there are doing this as a class project, led by (above, second row, far right), teacher Bridget Steele. To her right is her Climate Recovery partner, climate coach Barry Kastner. Together with other Columbus mentors, they have led the youth on expeditions to meet with city councilors (to the right of Barry is City Councilor Elaine Wagner), and to interview their mayor. Along the way, these young people have learned from experts such as Felipe Rocha (second row, far left) from Cummins, on issues regarding sustainability. On Thursday, March 9, St. B students held a mock City Council meeting to practice their testimonials. Numerous community volunteers, including two City Councilors, listened and gave feedback. Cora and Molly at City Hall in Bloomington, before Molly's presentation to the Bloomington Commission on Sustainability. The Commission was very responsive to her proposal to thread youth-led climate recovery work into Bloomington's already-existing sustainability initiatives and planning. A highlight of our annual week-long Climate Camp with the Peace Learning Center and HEART, was our mock City County Council meeting in Indy's public chamber, where City County Council meets regularly. Thanks to Councilors Adamson and Evans, we had the room for 90 minutes; thanks to Judge David Dreyer for stopping by to work with our Climate Camp campers. As you'll see from the photos below, the campers prepared testimony regarding climate recovery, practicing their speeches and getting feedback from campers and from adults like Judge Dreyer and Kristina Hulvershorn, Climate Camp co-director. In cities elsewhere, these mock city council meetings feature glossy photographs of the councilors so attendees can "see" who they are testifying to. In our case, one of our campers is Lucy, 13, a prolific portrait artist. She did portraits of all 25 councilors! To read a full report of this Climate Camp, go here. Ben, 15, from International School of Indiana, testifies to, in the foreground, Judge David Dreyer. Ella, a student at School 91, inspects Lucy's portrait work. Ocean, 11, a student at St. Thomas Aquinas, focuses on the science of climate change in her testimony. Carter, from School for Community Learning, considers his testimony. On Aug. 15, City Councilors Jared Evans (left) and Zach Adamson (right) met with North Central High School Sophomore Cora Gordon to discuss the Climate Recovery Resolution and its next steps. On Friday, July 8, our Carmel and Indianapolis team met with members of Indy's Office of Sustainability to discuss our Climate Recovery Resolution project. Participants included (starting from top left) Leslie Webb and Miranda from Carmel; Tabitha from Butler University, Melody Park from the Office of Sustainability; Cora from North Central High School; Jim Poyser, director of Youth Power Indiana; Matt Mosier from DPW; First row, Molly (IU), Vanessa (International School), Lillian (Sidener Academy) and Delia (Brebeuf Jesuit). Was jump started early in 2016 by Maddie Adkins (below, right) and Leslie Webb (not pictured here). Alex (left) quickly joined, and here, the two pose with Mayor Jim Brainard. Alex Workman (left) and Maddie Adkins (right) discuss the Climate Resilience and Recovery Resolution with Mayor Jim Brainard. Below find more photos from additional youth working on Climate Recovery. An early 2016 Indianapolis meeting at DeveloperTown, including our friends from the Carmel Promise Project. Indianapolis City County Council Vice President Zach Adamson (left, bottom, "No Mean City" shirt) spent the day with us, and talked with us about how municipal government works. In early 2016, Maddie Adkins, who created the Promise Project in Carmel, spoke at numerous venues in Indianapolis, including School for Community Learning. Students there learned about climate change, and the Climate Recovery actions kids can take. By May, 2016, youth leader Molly Denning began to visit area schools to talk to kids about climate change and climate recovery. Here is Molly at Noblesville's Promise Road Elementary. Here, Carter Brooks speaks to his entire school, School for Community Learning, about the importance of signing the Petition to support Climate Recovery in Indianapolis. In May, 2016, Shortridge High School students dug in the on the Climate Recovery project, researching various aspects of the initiative. Here, Holly Jones (left) from the Indiana Urban Forest Council helps students understand how trees can be measured to assess carbon sequestration. South Bend youth call themselves the Youth Climate Task Force.